“Secret Sedona” with 10 New Photos!! The 8th edition of my “Secret Sedona” book just arrived. HOT off the press!!! And the publisher, Arizona Highways Books, has updated it with 10 NEW PHOTOS. Editor Kelly Vaughn Kramer, photography editor Jeff Kida, and I worked together selecting the new images. The decision making process was carefully thought out, and in the end their selection of unique and fresh perspectives literally jump off the page. My visual chronicle of journeying among the red rocks has been a labor of love every step of the way. In the 3rd edition we updated it by adding 22 hikes with a full-color map to trailheads. Now, in the 8th edition, we invigorated it with bright, colorful, and inspiring new images… sunlit fog drifting below Thunder Mountain… a sweeping side canyon framing Secret Mountain… late-evening pink clouds above Sunset Crater… and more. 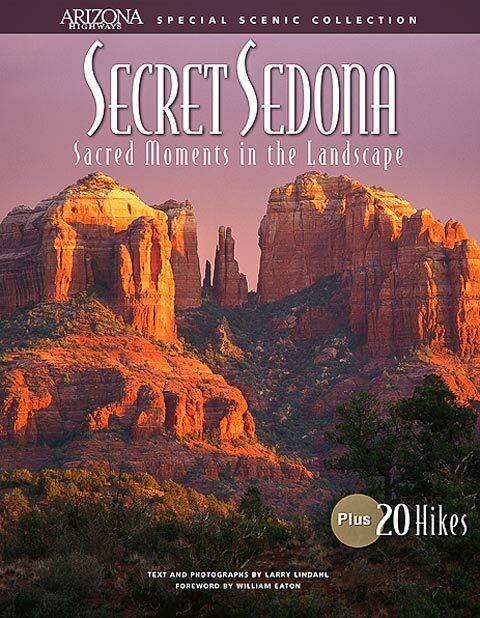 The latest edition of “Secret Sedona” is now available from the online Arizona Highways bookstore or Amazon.